I recently finished reading a book by one of my favorite authors. 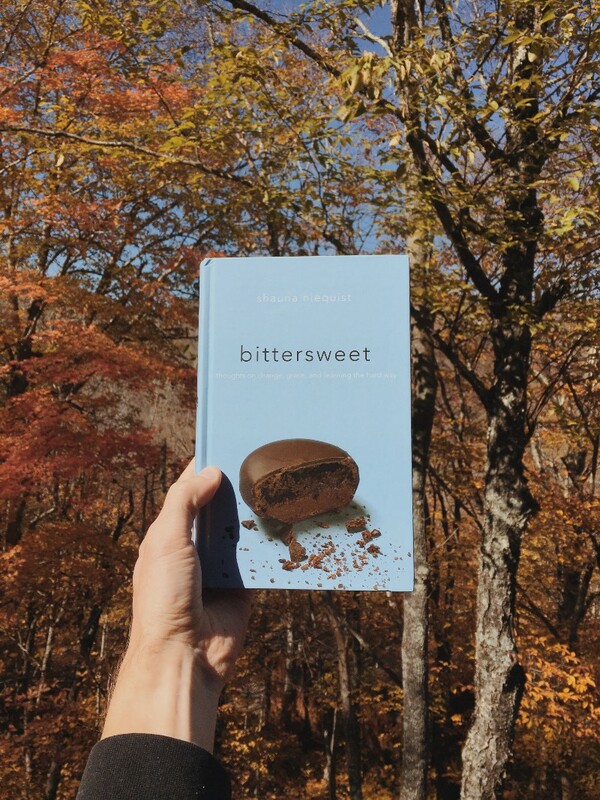 It’s similar to the book I wrote about exploring change, conflict, and relationships without losing God or myself, so it felt especially relatable to read all the stories and insights Shauna Niequist included in her book, Bittersweet: Thoughts on Change, Grace, and Learning the Hard Way. Shauna gets why it’s important for each person to leave what she knows, search for what’s true and good, and forge her own path through life’s variables. Navigating all the choices in adult life can be exhausting, but the adventure and meaning is worth it. “I know that most people need a season of space, a time to take a step back and evaluate the spiritual context of their youth. I didn’t go to church for a long season in college, and that space and freedom was so important for me. It gave me the perspective I needed to find my own faith. But it’s very easy for a season of space to turn into several years without any kind of spiritual roundedness. It’s easy to wake up several years from now and find yourself unable to locate that precious, faith-filled part of your heart and history, because it slowly disintegrated over months and years. Don’t do that. Do whatever you have to do to connect with God in a way that feels authentic and truthful to you. Do it now, so that you don’t regret the person you become, little by little, over time, without it. This is the thing: when you start to hit twenty-eight or thirty, everything starts to divide, and you can see very clearly two kinds of people: on one side, people who have used their twenties to learn and grow, to find God and themselves and their deep dreams, people who know what works and what doesn’t, who have pushed through to become real live adults. And then there’s the other kind, who are hanging on to college, or high school even, with all their might. They’ve stayed in jobs they hate because they’re too scared to get another one. They’ve stayed with men or women who are good but not great because they don’t want to be lonely. They mean to find a church, they mean to develop honest, intimate friendships, they mean to stop drinking like life is one big frat party. But they don’t do those things, so they live in kind of an extended adolescence, no closer to adulthood than they were when they graduated college. “You don’t know what the story is about when you’re in the middle of it. You think you do, but you don’t. You make up all kinds of possible story lines: this is about growing up. Or this is about living without fear. You can guess all you want, but you don’t know. All you can do is keep walking. Enjoy stories about growing through discomfort, transitions, and community? Get free chapters from my upcoming book, The Variable Life: Finding Clarity and Confidence in a World of Choices.